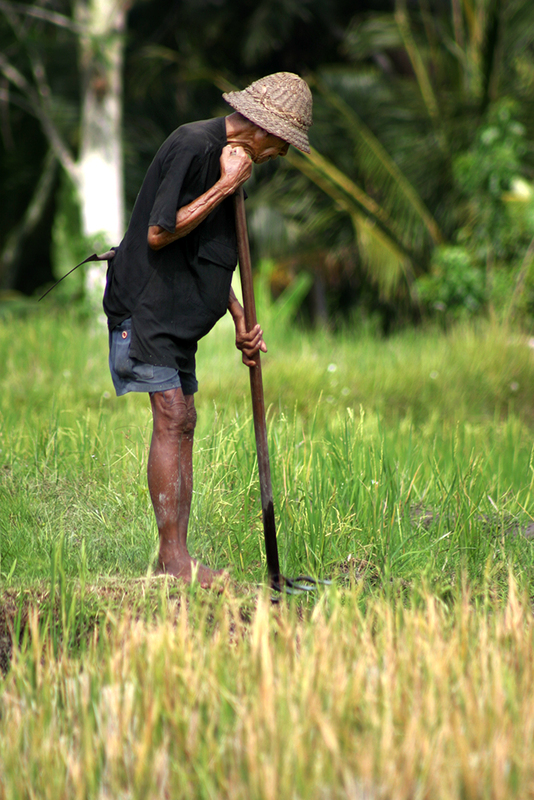 Visiting the rice paddies in Ubud is incredibly peaceful, and the area provides spectacular photographic opportunities for shutterbugs. It can also be rather spiritual, for those in that frame of mind. 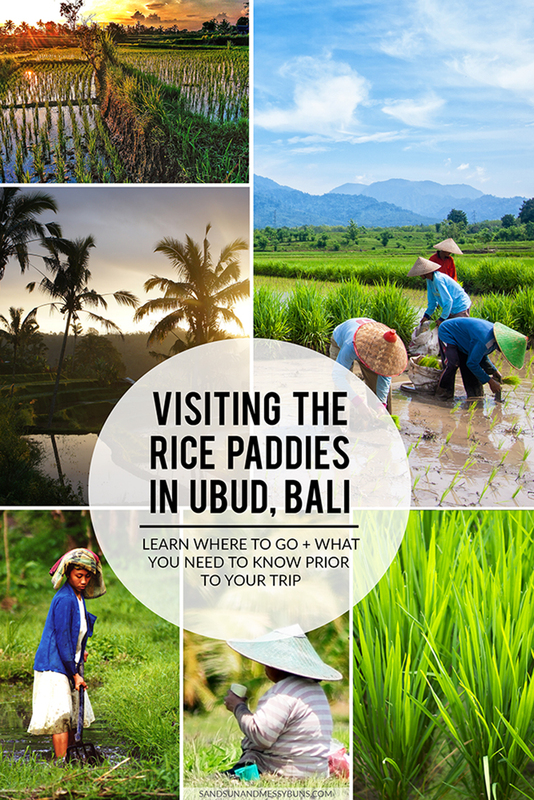 If you’re planning a trip to Ubud, it's worth it to seek out the more secluded rice paddies to include on your itinerary. While the Tegalalang terraces are beautiful, they're also packed with tourists and it's often difficult to get sweeping landscape shots. I skipped the touristy Tegalalang terraces and instead visited a few small rice paddies in Ubud's “Valley of the Kings” area. 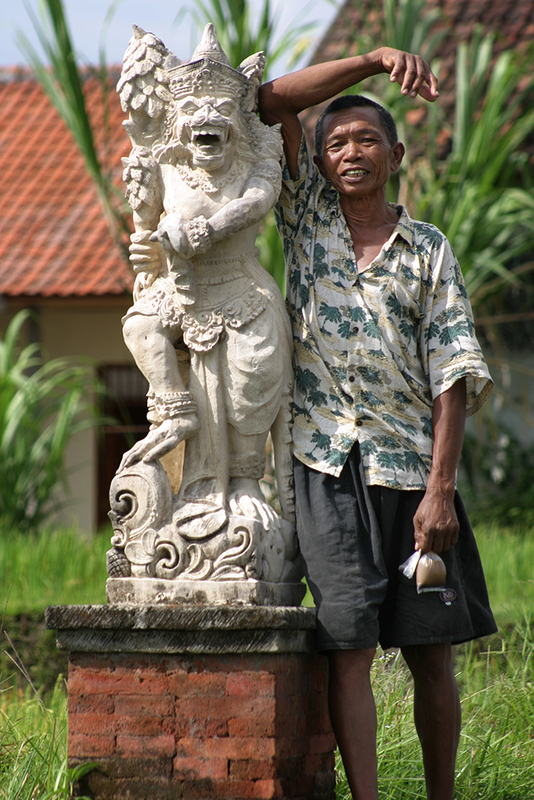 The region is aptly named due to generations of Balinese royalty who once lived in the nearby villages. While in Ubud, I stayed at Kamandalu Resort and was excited to learn there were rice paddies just a few steps away from the property! In fact, the majority of the resort overlooked lush, landscaped fields. It's so peaceful to enjoy breakfast while looking out over a sea of bright green grass waving in the breeze. I posted a full review of my stay at Kamandalu, since it still ranks as my favorite resort stay to date. TIP: The best lighting for photography is in the morning before 9 a.m. or in the early evening, prior to sunset. Midday sun is just too harsh, and your photos will appear washed out. Faces will also be in shadow since all of the workers wear hats. 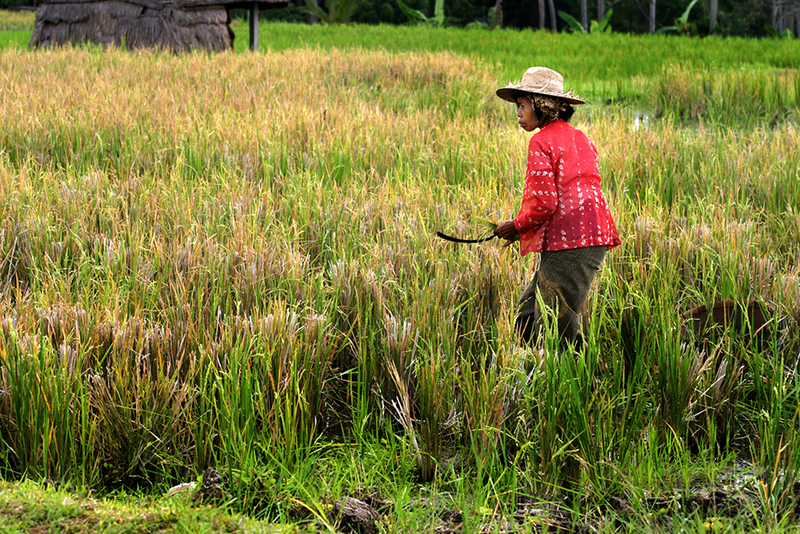 While some touristy rice paddies charge an entry fee, many do not. The rice terraces at Tegalalang seem designed more to attract tourists than to harvest rice, so expect a few donation requests there. 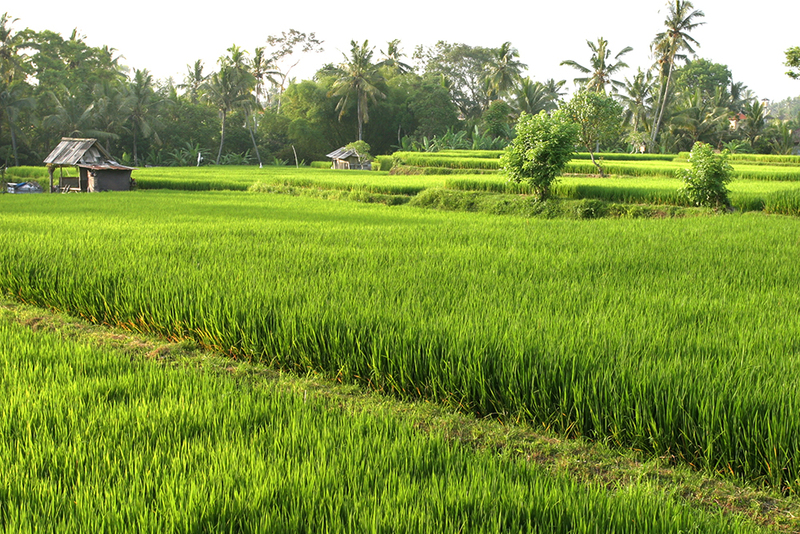 Many other rice paddies throughout the area can be explored at no cost, such as the ones discussed below. 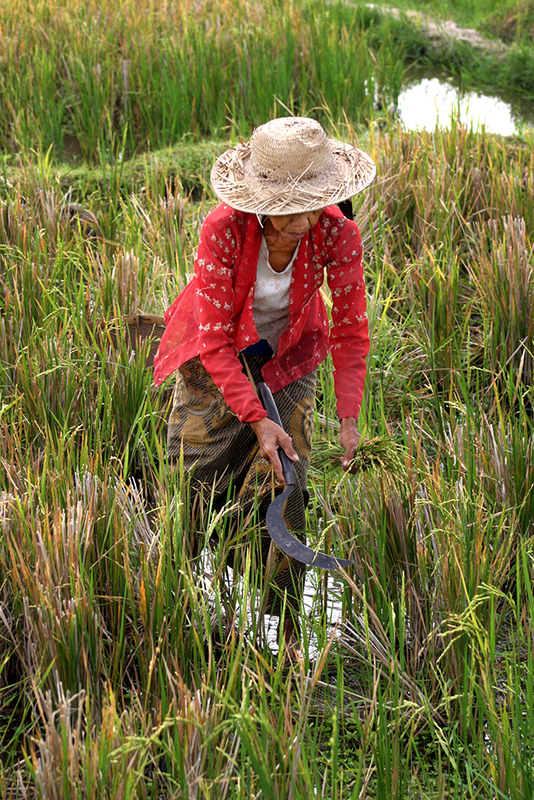 Wear comfortable shoes to trek through the rice paddies. It gets a bit muddy in some areas and the terrain is rather rough. You don't necessarily need hiking boots, but they are beneficial if you have them. If you're flying to Ubud and don't have room in your suitcase, you'll manage just fine with tennis shoes. The climate is warm year-round. Women should wear shorts or a comfy skirt and a sleeveless top or tee. For the guys, shorts and a tee work well. Bring a bottle of water and apply sunscreen before venturing out on your walk or bike ride. Chapstick comes in handy, too. Other than that, I'd avoid bringing a purse or anything bulky that you'll tire of carrying. There aren't bathrooms near the less-touristy rice paddies, so make a pit stop before you leave! March, April, and May fall at the end of the rainy season, so it's a very lush time to visit. I visited in November and it was also very beautiful. Avoid December, January, and February since that's the prime rainy season. I highly suggest early morning or sunset visits vs. the middle portion of the day. A sunrise or sunset over the rice paddies may be one of the most picturesque moments you can experience on this planet. 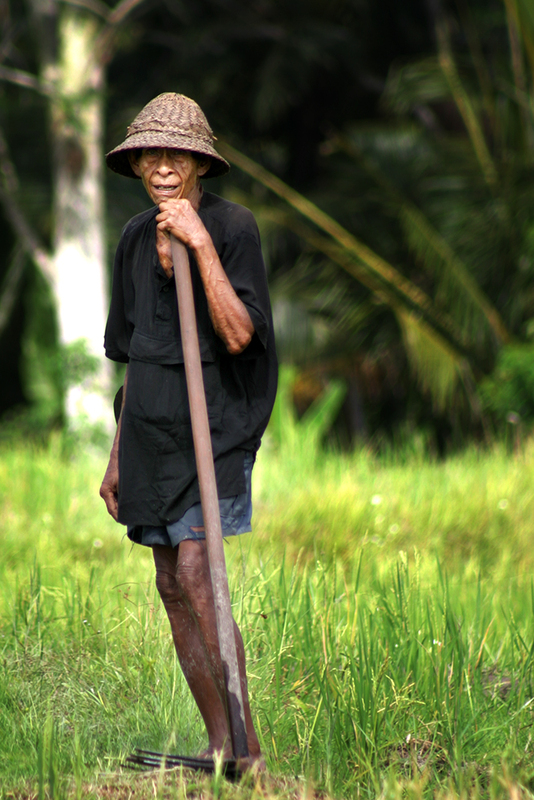 I saw men and women working the fields, but one older gentleman in particular captivated me. He appeared to have spent his lifetime working outdoors. He walked with a slight stoop and had worn and leathery skin. I detected visible areas of what was likely skin cancer and counted each rib in the v-neck opening of his shirt. As I approached with my camera, he gave an approving nod, then methodically went back to his business tending the field. It was a brief exchange, but I've never forgotten him! Anytime I think I have it rough, I imagine what his life is like and am humbled. One female worker dressed in bright red stood out to me as well. She smiled frequently and seemed very friendly, but was also very focused on the job at hand. I didn't approach anyone, because I didn't want to disturb them or disrupt their work. However, this guy practically skipped towards me; he was so eager to talk! My new friend was extraordinarily happy and his grin stretched from ear to ear. He spoke enough broken English to let me know it was OK to take pictures. I managed to let him know I'd traveled from Texas. He kept asking if I wanted a picture of him (of course!) and was happy to pose for my camera. He's the only person I tipped during this particular trip, because I preferred to observe everyone else from afar. He didn't request money, but I offered since he posed so willingly. I never got around to inquiring about what was in that baggie in his hand or if it contributed to his good mood, but he was definitely a chatty guy. 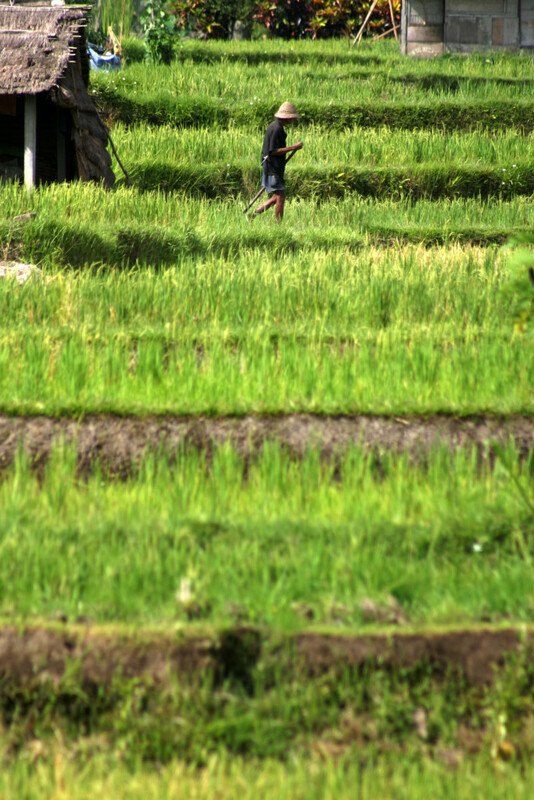 The majority of my photos are of rice paddies situated along a small road between the Kamandalu Resort and Viceroy Bali. Even though the field workers all carried machetes, I walked to the paddies by myself and felt 100% safe. With other hotel guests and locals wandering around, you won't feel as if you're in any danger. The majority of the people living in Ubud practice Balinese Hinduism and are amongst the friendliest and most peaceful people I've met during my travels. I suggest the normal precautions for solo female travelers. However, rest assured that this is one of the places I've felt safest. TIP: When traveling alone in a foreign country, always let someone know your itinerary and stay alert. 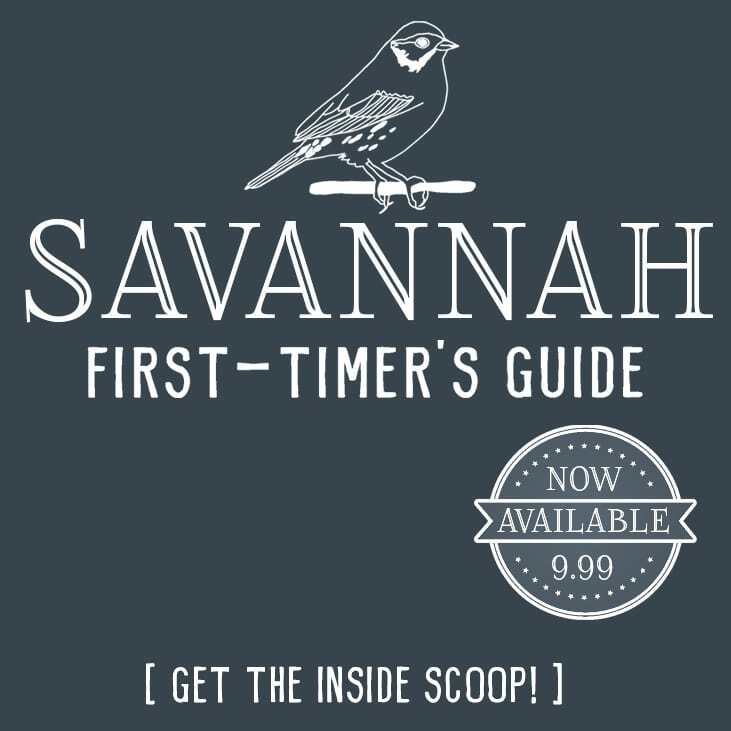 Leave a note at the front desk detailing your plans and expected return time. A telephoto lens is great for capturing candids of the field workers. Bring a wide angle lens for sweeping landscape shots. I'd suggest a UV filter to really make the clouds pop. A grey card is a necessity for white balance, because there's nothing in the fields to use as a reference point. A tripod is beneficial, but not an absolute necessity if you aren't comfortable lugging it around. The Manfrotto BeFree Tripod is one of the highest rated lightweight tripods that withstands professional travel use. If you're looking for something smaller and more portable, I love our Bestshoot Desktop Mini Tripod. Ready to book a trip to Ubud? Find the cheapest airfare now with Skyscanner. If you have any questions, please comment below and I’ll do my best to answer. The rice paddies are definitely worth a visit, particularly when you venture off the beaten path and select the lesser-known options. Very picturesque, beautiful pictures. Sounds like a wonderful place to visit. It really is. Bali is my favorite place I’ve ever visited! Erin, great article on your trip to Bali! I miss that place and all the the unforgettable people we meet on travel! I wish I could have captured those moments like you have. Thanks for sharing your trip! Thanks, Simon! I miss it, too. Bali really is an unforgettable trip.